Will Wiles: "Let's save some of the Whitechapel Fatberg"
The 130-tonne "fatburg" discovered below the streets of east London earlier this month serves as a reminder of how sophisticated Victorian engineering has liberated people from having to think about waste, says Will Wiles. In 1965, American sculptor Claes Oldenburg proposed an object of quite unforgettable brute simplicity for New York City. Oldenburg may be best known today for his cuddly "soft sculptures" and monumental pop-art reproductions of everyday objects, but this was neither cuddly nor pop. Like most of Oldenburg's provocative 1960s work (such as the Thames ballcock), it was completely impractical – and that was precisely the point. Monument for the Intersection of Canal Street and Broadway, NYC, never existed beyond a couple of hasty sketches. But if realised, this multi-storey block of solid concrete would have completely filled the intersection, turning a crucial urban crossroads into four dead ends. There was no courtesy or decorousness to the plan. This was not a memorial that would keep out of the way in the park or the plaza, or in the middle of a roundabout. It was obstructive and ugly and costly and irreversible. Oldenburg's message might not have been subtle, but it was perfect: a gargantuan blockage is the perfect memorial. It's a measure of the sophistication of our own age that today's perfect monument has come into being without the intervention of an artist. Deep beneath the streets of east London lurks the Whitechapel Fatberg – an immense agglutination of waste that has seized one of the neighbourhood's Victorian sewers, threatening it with the urban sanitation equivalent of a massive stroke. As the name suggests, fatbergs are largely composed of cooking fat. They were first noticed in the sewers under the West End, and were reported as a horrifying byproduct of that area's concentration of fast-food restaurants. The Whitechapel monster smashes previous records, aided by people flushing things they shouldn't, such as condoms and baby wipes. 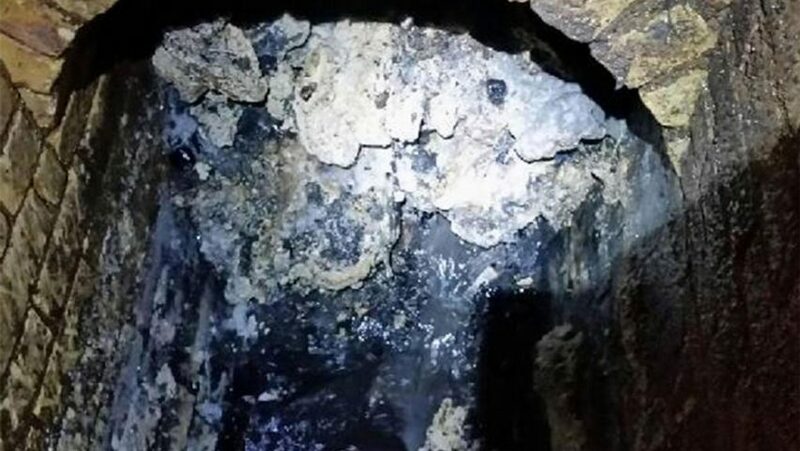 The fatberg weighs an estimated 130 tonnes and will take three weeks to break apart, using pick-axes and water jets, according to the New York Times – that's correct, the New York Times. The Whitechapel Fatberg was international news, because it's unlikely New York's sewers smell of the Body Shop. The day after news of the fatberg broke, the Museum of London announced that it was interested in acquiring a section of the thing for its collection. The practical barriers to this are considerable, as well as revolting – how can a slice of the 'berg be removed intact, and how can it possibly be preserved and displayed? But before we get to those, there's the question of why. Exactly how pure are the museum’s motives? Since Paola Antonelli pioneered it at the Museum of Modern Art in New York, "rapid-response collecting" has been a twin-pronged instrument for curators. One prong is the assembly and maintenance of a modern and relevant corpus of objects that give a sense of the milieu of a period, getting away from the idea of the museum as a hermetic archive and giving it daily life. But the second prong has always been publicity – keeping said museum in the news by trailing the headlines and meme pool with eye-catching acquisitions. The Museum of London is a treasured institution, but one eager for an image refresher, particularly as it moves to a lavish new Stanton Williams-designed home in Smithfield in 2022. I hope, however, that the move to extract and preserve part of the fatberg isn't simply a PR ploy that will be abandoned when the difficulties become apparent. In fact, I hope that a perfect cross section of the blockage can somehow be excised, showing the dimensions and shape of the pipe it was lodged in. It could become an unconscious Rachel Whiteread sculpture of London's waste systems, an expression of the negative space of the sewer network. We would be able to see the sophistication of the system's Victorian design – many of the earliest brick sewers are have an inverted egg shape in cross section, to aid the flow of waste. And we would be brought face to face with its nemesis, ourselves, architects of this extraordinary compound of refined fats and highly engineered, near-indestructible disposable products. Consider the sublimity of the wet wipe – as a father, I can tell you that I have. The obvious product of a hugely advanced technological civilisation, the pinnacle of a vast pyramid of materials science, product development and mass-manufacturing, finely tuned to our convenience. But its majesty is tinged with terror. Having made this remarkable object, and having used it, we can't get rid of it. It's a bargain worthy of WW Jacobs' infamous Monkey's Paw. Even in the bin, it heads to landfill, a waste problem of similar magnitude – or perhaps, at best, to the incinerator, which has its own dubious environmental and public health impacts. It's not clear from the short video clip supplied of the fatberg whether it forms a total blockage, which would allow us a perfect profile of the sewer if a slice were removed – it appears to be more like a glacier filling a valley. Nevertheless, negative space is the perfect way to think about the sewer, and the broader way that we deal with all our unpleasant waste products, from worn-out toothbrushes to spent nuclear fuel rods. All our advancement is based on sophistication of use, and the able wet-wipe is the perfect example of that. As we have focused so doggedly on use, so we have created an inverted shadow-pyramid of disposal, pointing down to the fissures of the earth where plutonium will tick away its half-life, down to the guts of seabird silting up with plastic fragments, down to the fatberg. The underworld and the gut are related. "The sewers are not an abyss for household rubbish," Thames Water's head of waste networks, Matt Rimmer, told the Guardian. But that is precisely the way that the civilised mind wants to think about sewers. It would prefer not to think about them at all. Indeed, the whole direction of civilisation is towards liberating the majority of people from having to think about waste – the sewer is no more than a black hole, invisible and endlessly accommodating, but fundamentally someone else's problem. Pop culture must share in the blame, with its repeated insistence that the sewers are chthonic palaces well suited to dramatic showdowns or clandestine headquarters. The sewer might not have the physical remoteness of the Great Pacific Garbage Patch, but it shares the same conceptual remoteness. Let's save some of the Whitechapel Fatberg for the city. Let us draw some lessons from it, and let it make the sewer more visible. If neglected, these infrastructural negative spaces have a tendency to make themselves more visible in horrifying ways.